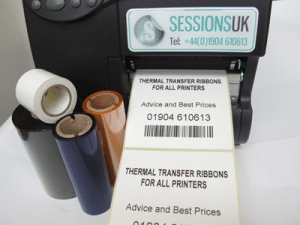 Sessions UK offer a comprehensive range of high performance thermal transfer ribbons suitable for any type of desktop or inline printer you may use. There are 3 main types of thermal transfer ribbons – wax – wax/resin and resin. For a quality printed image it’s vital to get a good match between the ribbon and the label material. If you’re not sure which ribbon is right for your application our experienced team can soon point you in the right direction. We can also supply free samples for testing prior to ordering. In addition we can supply hot stamping foil in a wide range of widths and lengths. If you need more information, a free sample or a quote please fill in the form below. Or, for more information on our labels and thermal ribbon transfer, please visit our store, SHOP NOW!